Fans of Indian sport were given two heart-breaking results on day three of the 2016 Rio Olympics, both within moments of each other. Having beaten Ireland 3-2 in their first group match on Saturday, the men’s hockey team conceded a goal with three seconds left to lose 1-2 to Germany; not long after, Abhinav Bindra exited his final Olympics by ending fourth in the final of the men’s 10m air rifle event – missing out on a bronze medal by just 0.1 points. Though India’s hockey team have four games to go in Rio de Janeiro, for Bindra – gold medalist at the 2008 Beijing Games – his last appearance at the Games ended in agony. In his third final in five attempts, Abhinav bowed out of the competition at fourth place at the Olympic Shooting Centre. Having entered the final with a stunning recovery in the qualification round earlier on Monday, the 33-year-old held his composure – honed over years of zen-like focus and training – to move up the table and into the top three. However, just towards the end he fell back to fourth and then ended up short of claiming bronze. 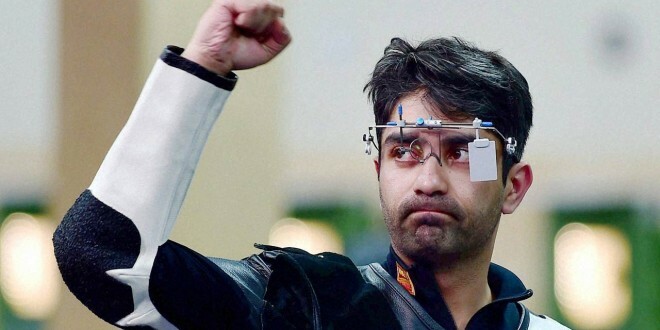 It call came down to Bindra’s last shot, which was a 10 – but not enough to earn him a second Olympic medal. At the Olympic Hockey Centre in Deodoro Park, the Indian men’s hockey team’s perennial habit of conceding late goals continued to haunt them. After weathering India’s attacking onslaught for the majority of the game, the Germans – reigning double Olympic champions – exerted tremendous pressure on the Indian defence in the final two minutes. For India, who played near perfect hockey for the majority of the match, conceding a goal with just 3.1 seconds from full time was gut-wrenching. India women hockey team too fell short against Great Britain as they lost their second Pool B match 0-3. India conceded two quick goals in the second quarter, after holding the higher-ranked Great Britain 0-0 in the first quarter, which took the game away from them. And they conceded a third goal early in the third quarter. India women now have a draw and a loss to show for after two matches in their historic Olympic appearance in 36 years. India face Australia in their next match on Wednesday. The other news from Rio de Janeiro was not encouraging from an Indian perspective. In the men’s 10m air rifle qualification, Gagan Narang, a silver medal winner in London four years ago, squandered a brilliant start to finish exit the event. In the men’s trap qualification, the pair of three-time Olympian Manavjit Singh Sandhu and debutant Kynan Chenai finished 16th and 19th respectively. India’s Laxmirani Majhi was eliminated from the women’s individual archery event, losing 1-7 to Slovakia’s Alexandra Longova. Majhi, one third of the women’s archery unit that was beaten by two points their Russian counterparts a day earlier, lost the first two sets of her event, drew the third and then lost the final. he remaining two Indian women archers, Bombayla Devi and Deepika Kumari, will feature in the same event on Wednesday (18:09 IST) and Thursday (01:27 IST) respectively. At the Olympic Aquatic Stadium, swimmer Shivani Kataria began her campaign by finishing second in the women’s 200m freestyle event heats but eventually ended at 41st, thus exiting the competition. Her compatriot Sajan Prakash, with a time of 1.59.37, came in fourth in the men’s 200m butterfly heats and overall was 28th.